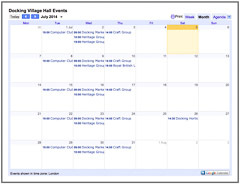 Docking Village Hall is home to a number of different local clubs and societies, the details of which can be found below. Docking Heritage Group - formed in 2007, our aim is to research, record and present the history of Docking in a way that encourages others to take an interest in and appreciate their local heritage. See our website here. Brownies - every Wednesday 5:00pm - 6:30pm, Contact Mandy Craig - 07769 583 439 or e-mail.